Recently, another food trend has surfaced and people – kids, teens, and even adults have been raving all about it. 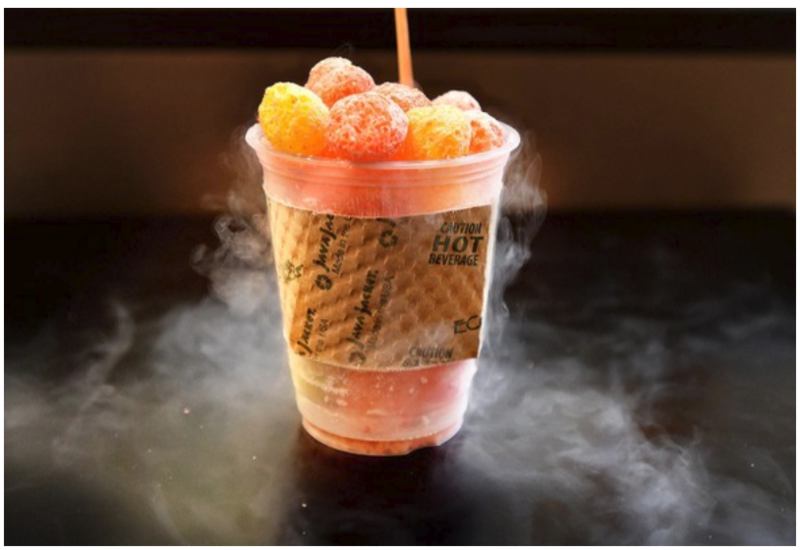 The popular food item titled, ¨Dragon’s Breath¨ or in some places ¨Snowballs¨ has been causing people to search all over to try the delicious treat. Now, what is this trendy treat? Dragon´s Breath is rice cereal balls dipped into liquid nitrogen, which is indeed the coldest substance on earth. The liquid nitrogen causes the cereal balls to instantly freeze and this makes a cold ¨smoke,¨ if you will, arise from the cereal puffs. When hearing about this trend, I knew I had to try it. On Sunday, I decided to visit ¨I Am¨ (#NotSponsored) in the Anaheim Packing District. This little snack place has very trendy desserts that everyone would enjoy like Korean shaved ice, smoothies, and of course, Dragon´s Breath. I decided to also watch them prepare the frozen dessert. The worker who was preparing the snack poured rice cereal balls into a cup and dumped a whole bunch of liquid nitrogen into the cup. From there she put a cardboard cover around the cup (having direct contact with the cup after recently touching liquid nitrogen can cause freezer burn). The dessert also came with a delicious chocolate sauce. Anxious and nervous to try it, I dug in to find something very exquisite about the dessert. It was very tasty, especially with the chocolate sauce, as if the liquid nitrogen had affected the rice puffs in some way. However, there was one, unignorable aspect of this treat; the smoke. Everyone consuming this treat would have smoke flowing out of their mouth and their nose as if someone was smoking a cigarette or an e-cigarette. Of course, liquid nitrogen (although cold) is completely non-toxic, but it is still a form of gas; that of which is being consumed and going into your lungs. I don’t suffer from asthma, which I am grateful for, however, I had a struggle with breathing after consuming this snack. After realizing this, I knew I needed to do research. What I discovered is absolutely shocking. What I had hypothesized before is almost correct. Although non-toxic, liquid nitrogen is a dangerous gas that you should not inhale into your body by eating these treats. It is not nearly as bad as vaping or smoking, however, you should still try to stay clear of it. Overall, is Dragon’s Breath dangerous? Well, absolutely. However, I think you should still try the treat at least once, but don´t eat it too often or you could end up just as unfortunate as little Johnny McKinney was. If something doesn’t seem right, it probably isn’t, Cougars. Now I feel good that I never had this. Good job, Gavin!!! I’ve eaten these many times. This is a really educational article, great job Gavin! A few questions: Is Dragon Breath still dangerous when the liquid nitrogen is dried? Also do the people who prepare it drain the liquid nitrogen out before people consume it? How dangerous would this be for me, since I had asthma when I was little and it comes up from time to time? If you let it sit for at least ten minutes, the liquid nitrogen gets less ¨smoky¨ if you will but it defeats the purpose a little bit. In since you have asthma I would recommend not having it, it´s really just not worth the risk.